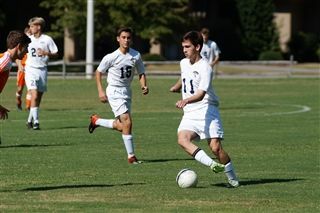 The O’Neal School boys’ soccer team earned its third straight victory on Tuesday night, in a very close game against a very good opponent, winning 3-1 vs. Grace Christian School of Raleigh. After an even first half, tied at 1 goal apiece, the Falcons broke through with two second half goals. The victory moves O’Neal to 5 wins and 1 loss on the season and 3 and 1 in EPIC Conference play. Sophomore Spencer Sullivan (2019) scored all 3 of O’Neal’s goals. O’Neal’s defense played very well in a tough encounter. O’Neal returns to action on Thursday (9/15) evening, travelling to Cary Christian School for a 5pm, EPIC Conference match.